It’s never too early to start planning for Holiday Fun and we found 10 great Holiday Events in San Antonio, Texas for you! The Holidays are soon upon us! And the city of San Antonio really knows how to celebrate the Holiday Season. 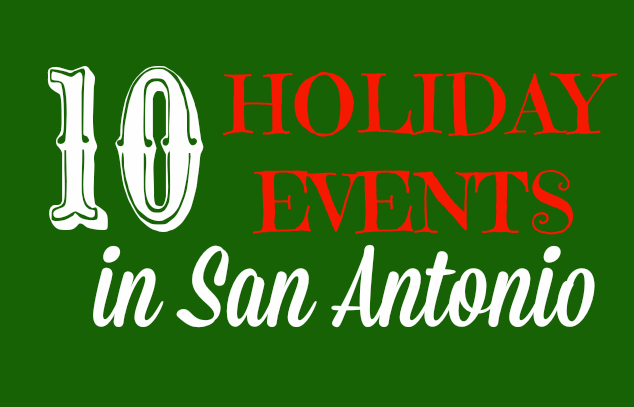 Check out these fun Holiday Events in San Antonio in November & December! A drive-thru Christmas Light Park is located just 15 minutes north of San Antonio on I-35. With over 1 million lights and 100 displays & animations, the one mile drive thru park is seen from the comfort of your own vehicle. See San Antonio’s favorite park get dressed up for the Holidays with special decorations, Holiday-themed shows, hot cocoa, Santa Claus and more! Our favorite is SnowWorld, where you can have a snowball fight & go sledding….in Texas! Christmas Celebration is included with the park admission. The Zoo Lights is a nighttime holiday tradition for the whole family! Stroll under hundreds of thousands of twinkling lights while you sip hot cocoa, roast s’mores and enjoy an all-new light show. Plus, visit Santa and tell him what’s on your Christmas wish list. Also, new this year is the ice skating rink and camel rides. The University comes alive with millions of twinkling lights with a big production & candlelight processional on November 17. Lights across campus will remain on through January 6. This classic tale comes to life with Ballet San Antonio and the San Antonio Symphony. It’s the perfect family traditional Christmas show. Get your tickets now. If you miss these performances, you can see the Moscow Ballet perform The Great Russian Nutcracker at the end of the month at The Majestic too. Christmas in San Antonio would not be complete with out time spent seeing the River Walk dressed in twinkly lights. And the River Parade is such a fun event to kick-start the season off. If you miss the parade, make sure to come down and enjoy nightly River Boat Caroling thru December 21. On Weekend nights leading up to Christmas, head to Morgan’s Wonderland for a special twinkly-lights & music show, a petting zoo, Santa Claus, and more. The week before Christmas, the event is every evening Thursday-Tuesday. The Magik Theatre returns with the 4th annual production of A Charlie Brown Christmas! The classic animated television special comes to life in this faithful stage adaptation, in which Charlie Brown, Snoopy, and the rest of the Peanuts Gang discover the true meaning of Christmas. When Charlie Brown complains about the overwhelming materialism he sees among everyone during the Christmas season, Lucy suggests that he become director of the school Christmas pageant. Charlie Brown accepts, but this proves to be a frustrating endeavor. When an attempt to restore the proper holiday spirit with a forlorn little Christmas fir tree fails, he needs Linus’ help to discover the real meaning of Christmas. Spend an evening here with nighttime train & hay rides, decorated miniature train layouts, and a visit with Choo Choo Claus! This “holiday-themed multimedia spectacular of lasers, light effects, and 3D animation choreographed to your favorite holiday carols” sounds amazing! Only 1 performance for the public (the other is for students), so make sure you catch it. These are just a few of the tons of great holiday events in San Antonio this season. A few other great resources to find more are the San Antonio Mom Blogs and Visit San Antonio website.